The trial of Larry and Carri Williams, accused of homicide by abuse, manslaughter, and first degree assault of a child, is in the second week of what could be a total of 4 to 6 weeks. Gina Cole, a reporter for the Skagit County Herald, has been covering the trial from the start; here is today’s article. 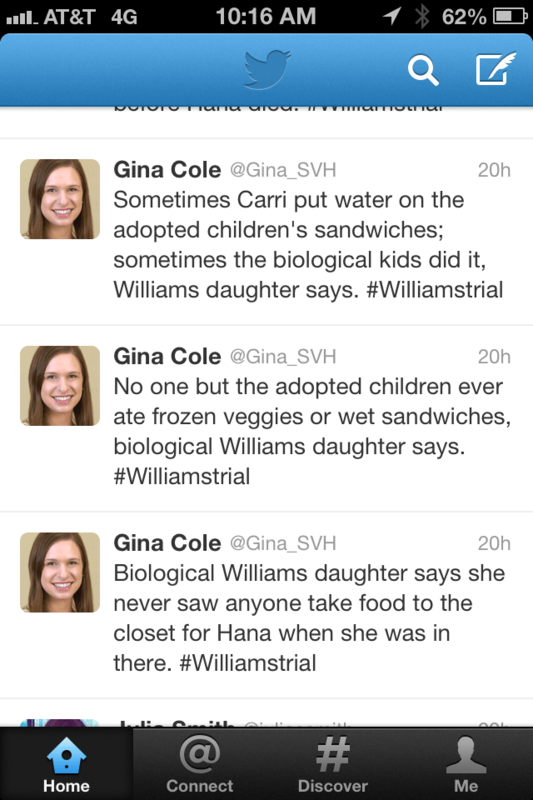 She also tweets (@Gina_SVH) at #Williamstrial; here are some of her tweets from yesterday. The benefits of hindsight are in operation here, I realize. Nonetheless, the way that the adoption of Hana and Immanuel was handled presents an excellent opportunity for an adoption-related Case Study. We need to make changes in adoption policy, in a conversation that includes adoptive parents, adopted persons, and first parents. I challenge adoption agencies and licensing authorities in particular to step up. Background (Verifiable Facts): Adoption Advocates International (AAI) has been a US and international child-placing agency since 1983, licensed in the state of Washington. Additionally, AAI is a member of the Joint Council on International Children’s Services, and is accredited by the Council on Accreditation. (Note from Maureen: It doesn’t take any insider knowledge to recognize that licensing and accrediting bodies must be watching this trial very closely. JCICS does not license or accredit. It does have Standards of Practice for all member agencies, and those standards include some enforcement mechanisms. Based on the testimony of Gay Knutson, currently AAI’s Director of Social Services, AAI did the home study, placement, and post-adoption work (as required by the state of Washington for licensing and in conjunction with the COA accreditation requirements) for the Williams’ family. Ms. Knutson testified that AAI has, in the so-called “family file,” the following documents for the Williamses: the home study, the child placement file, the personal data sheet for Larry and Carri Williams, the Welcome Home packet, the Post-placement Information, and the Post-Placement reports submitted by the family. According to Ms. Knutson, the home study is done at the beginning of the adoption process. It is a 10-20 page document to ascertain whether the child will be cared for properly in the home. The post-placement reports, according to Ms. Knutson, let the adoption agency and the country of origin know that the children are well, inform them about the children’s overall well-being (via photos, health updates, school information, hobbies, interests, etc. ), and indicate that any needed services are being sought. So those are some of the facts. In Part 2, I ask Case Study Questions, and welcome discussion. Pingback: Williams Trial – Day 9: Testimony of Williams Son | Why Not Train A Child? Pingback: Williams Trial – Day 13: Testimony of Williams Son | Why Not Train A Child?